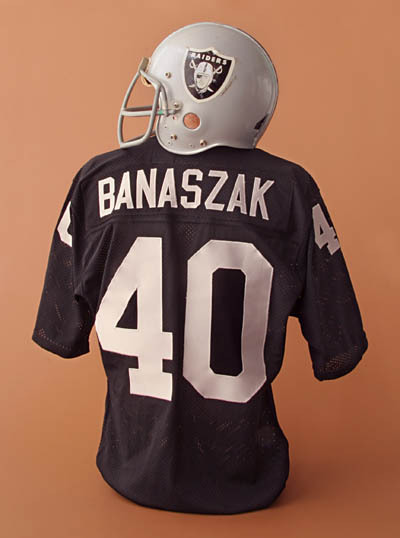 A native of Crivitz, Wisconsin, where he starred in football, basketball and track, and a stellar running back for three years for the University of Miami (Florida), Banaszak played his entire 13-year pro football career with the Oakland Raiders. Not a flashy runner, resembling more a bull-dozer, Banaszak produced spectacular stats: 3,767 yards in 963 carries; 52 touchdowns (47 on short-yardage plunges, five on passes) and 121 receptions for 1,022 yards. He scored two TDs in the Raiders’ Super Bowl IX victory against Minnesota. In 1975, he tied O. J. Simpson for an NFL-leading 16 TDs. Not many unspectacular football players make it into a Sports Hall of Fame. But then again, Pete Banaszak, a burly 6-foot, 210-pound bulldozing running back and punishing blocker in his playing days for the perennial contending Oakland Raiders of the National Football League, never did things in a spectacular way. “This will be one of the highlights of my career,” a proud Banaszak said upon learning he would be one of three sports celebrities to be inducted into the National Polish-American Sports Hall of Fame. Again, that’s a true picture of a modest athlete who was labeled a “lunch bucket” worker during a splendid 13-year career with the Raiders. He was the uncrowned favorite of Oakland fans as well as his teammates. All of them appreciated and admired his workmanlike habits on the football field. While Banaszak’s statistics might not be on the same page as some of the other more flashy ball carriers of his time, it is tremendously misleading, and unfair, to think Banaszak didn’t produce for the silver-and-black teams coached by John Madden and Tom Flores. Banaszak rushed for 3,767 yards in 963 carries for the Raiders. The performance is good enough for fifth place on Oakland’s all-time list. He scored 312 points on 52 touchdowns. Forty-seven of the TD’s were by his devastating short-yardage plunges and five by pass receiving. The total points rank him seventh on the team’s all-time list. Banaszak caught 121 passes for 1,022 yards. This is 16th best on the club’s all-time list. The Hall of Fame honoree’s combined 4,789 yards rushing and pass-receiving put him ninth in the Raiders’ all-time record book. Banaszak returned kickoffs and was an unflinching blocker that dashing ball carriers enjoyed shadowing. A bonus for the team was his dexterous performance on the specialty teams. The Raiders never had a losing season during the 13 campaigns that Banaszak toiled for them. Although Banaszak’s athletic achievements were more prevalent in the rugged professional football circuit, he likewise forged brilliant careers in high school and college. He is a product of a small northern Wisconsin high school in Marinette County. He was reared in the small rural community of Crivitz, where he starred in football, basketball and track. He won the state prep discus championship as a senior. He was a talented baseball player, too. At the University of Miami (Florida), Banaszak was a stellar running back for the Hurricanes for three years. He was the team’s most valuable player as a senior. He made the dean’s list as a student. A fifth round selection out of college, Banaszak had to earn his paydays with the Raiders until he established a foothold and proved what he could do. All-Pro offensive guard and NFL Hall of Famer, Gene Upshaw, was one of Banaszak’s admirers. “Some runners make it easy to block. They get to the hole fast and then you don’t have to stay with the man you block. Pete does that. He can really move,” Upshaw said. And then there was the comment made by a former Raider Coach John Rauch. “Give me 40 Pete Banaszaks and I’ll win you the Super Bowl,” he declared.